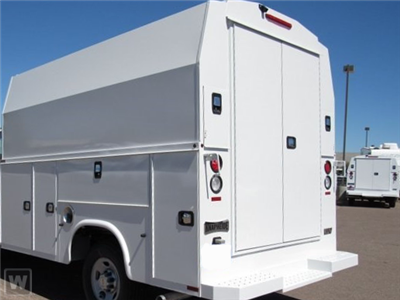 2017 Express 3500 Work Van Cutaway w/ KUV ENCLOSED SERVICE BODY, 2D Chassis, 6.0L 8-Cylinder, 6-Speed Automatic, RWD, Summit White, Medium Pewter Clot… h. Navigation, Keyless Entry, Locking Rear Diff, Trailering, Power locks, power windows, Tilt wheel, Cruise Control, Chrome Appearance Pkg, Rear Camera, Bluetooth..Parks Chevrolet! Located in Kernersville and Huntersville!Our Commercial Customers have numerous opportunities for special pricing and additional incentives. Contact us by e-mail at rpetit@parkschevrolet.com or call us at (336) 310-1769 for information on this or any of our many work-ready vehicles, vans, pickups, dump or flatbed trucks and many speciality bodies. We'll come to you!